Not everything is what it seems. From the outside, things can look sparkly and flawless, but what is it really like on the other side? Is the grass really greener? This week, we invite our ray of sunshine soul sister, Ashley Matsunami @ashmats to explore the different masks we've each had put on since childhood and what they look like now as grown women. After digging through our past, we finally own up to ourselves and tell the true stories of why we are the way we are. Spoiler alert: Being bullied and bullying has a lot to do with it. This week we want to give the biggest YAAASSS to a dear dear sister friend of ours... Jen (frmheadtotoe)! Jen is best known for her YouTube channel, of over 10 years, for creating beauty and lifestyle tutorials for her 1.2m fans! Throughout our friendship, we've had the privilege of having intimate talks about our struggles in the industry and our careers as women. Jen is now a first time mommy to the ADORABLE Aria June and we have TONS of questions! We dive into the expectation vs. reality of motherhood with our vastly different experiences and discuss the pressure of societal expectations for women to be mothers. Hopefully it will help change or confirm your thoughts on whether or not you want to have a baby in the future. It did for us! Ever feel the need to have and do everything as perfectly as possible? So no one will judge you, so you don't disappoint your parents, so you live up to your own expectations? Does striving for perfection prevent you from accomplishing your goals + dreams? Because you're afraid to fail, you never start that project you've always talked about or finish the ending to that script you've been working on for the past 6 months. Fear paralyzes us. We become terrified that the product isn't good enough or what we've envisioned. It's that little voice in our head that constantly reminds us that we could have been more. OMG YAAAASSS!!!! We've hit 25 episodes of PIP! We can't believe we made it! We want to thank all of you incredible, generous, and beautiful people (our PIP family) for listening and supporting us each week by sharing this very special treat: our first episode with a super special guest... the amazing and super inspirational Wendy Nguyen (wendyslookbook)! This week we talk about love, tips on why you should move to a new city, and soul mates. Wendy opens up about her own love journey with soul mates in people and cities: Do they exist? How does our belief in soul mates affect how we find love? And can we have multiple soul mates? We also share our love languages, how it has changed our love lives, and how we've learned to better communicate and receive love from others and ourselves! YAYY BIRTHDAY!!!! To celebrate both of our recent birthdays, we wanted to share our greatest life advice that we would give to our younger selves and YOU! Life has definitely taught us some powerful lessons and if we can do our part to make your lives a bit easier, we would happily do so. The thing is, everyone experiences FOMO on some level BUT the good news is, you can do something about it. This week, we share how we've come to say goodbye to FOMO FO GOOD! Here's the gossip on gossip: We all do it (or have done it) and it not only hurts the people you talk about, but you're also hurting yourself in the process. Gossip fuels negativity in all our lives and robs us of having genuine connections. Even when we convince ourselves it's harmless chit chat or we're just "sharing information," it all comes down our underlying intentions. Gossip has the great ability to reveal your own insecurities and internal battles which you then project onto other people. As we had this conversation, we also discovered and admitted to a few realities of why we gossip and how we've been making the conscious effort to reframe the way we see others and situations. At the end of the day, if we want to spread more positivity and exchange meaningful ideas & visions, then gossiping has no place in our lives. And we just ain't got time for it! For so long, the world teaches us to hate the way we look; from constantly wanting to change our natural features, to being extremely critical of every inch of our body. We constantly compare ourselves to these impossible images that we see on social/media that make us so unsatisfied with who we are. It is a daily battle to keep a positive body image of ourselves, and though we are still learning ourselves, we share how we cope with the process through self love. This is it. You've both said goodbye and now it's hitting you that it's over. It's really over. Take a deep breath. We got you in this episode. We know too well that feeling of complete heartbreak, doubt, and loneliness. Your soul aches and yearns for your ex. Did you make the right decision? Will you be happy again? How do you let go of not just the memories that you guys shared but also ... your best friend? The one person you've come to trust and lean on the most. Who do you go to now? What do you do now? #16 - Why Do Nice Girls Date A**holes? We've all heard that "Girls Like to Date Aholes," and as much as we would like to deny it as women, we have dated our fair share of aholes. So what's the deal? Why do nice girls date aholes? What's the appeal? If they really are aholes and these nice girls deserve someone better, why do these girls continue to stay with these guys?? And what's the real story behind nice guys who turn into aholes to get the girls? We believe these answers are something all three parties need to face (the nice guys, the aholes, and of course the nice girls). We share our own dating stories of how we've come to recognize the signs and internal reasons why we fell for a*holes. What is wrong with me? Not good enough get into the university I wanted, not good enough to get a date, not good enough to land a job, not good enough be loved...NOT GOOD ENOUGH! Sound familiar? We've all had these thoughts about ourselves, and probably thought worse things in our heads. It feels like no matter how hard you try, you can't dig yourself out of this rut. We let these negative voices take over and then it's a quick downward spiral of us against the world. But here's the secret: failing and taking risks is what helps you level up in life. Achieving your impossible dreams is done by learning from your mistakes and taking that risk over and over again until you are molded and shaped to be the right key to unlock the next level. You'll then discover that life will open up and unfold in ways that you never thought possible! And it will happen to you because you were created specifically to fight and win those battles. In the meantime, take a moment to look up at the stars and breathe in how wondrous life is. It will help you see that you had the power all along to change... everything. We've all heard the nice GUY story from the "nice guy's" perspective a billion times over, but what about the woman's side of the story? What goes on in her mind as her best friend confesses his love for her? Did he ever have a chance with her? What happens when a woman gets friendzoned? And why isn't a woman's "no, I'm not interested" ever enough but instead interpreted as a challenge to try harder? We've all been hurt before, and we've also hurt others. Most of us hate dealing with confrontation and have a really hard time apologizing, which leads us to tiptoeing around the actual situation and never actually resolving the issue. How do you get to a place where you can talk openly to the other person about your feelings and try to reach a real resolution? What if that person won't accept your apology or you're not ready to accept theirs? How do you both move on when one person refuses to forgive and forget? Can you get real closure if the other person refuses to give you one? Whether we did the hurting or need to do the apologizing, it's important for us to approach these situations with the right levels of maturity and sensitivity. Confronting a friend who hurt you takes a great deal of strength, but so does taking ownership of your actions and learning to apologize for your behavior. Regina shares her story of how she found the courage to confront her coworker in a difficult work situation and Christine finds peace within herself as she seeks a resolution for her tumultuous relationship with her dad. People have the tendency to disregard things that don't fit into their perfect perception of what the world is supposed to be like. They have difficulties understanding things they can't see and one of the biggest misconceptions is mental health. Everyone has dealt with mental health issues at some point or another, but so many people never address the problem directly. After a while, you begin to feel like you're in a rut; all those repressed feelings and emotions have no outlet, and it leads you to a downward spiral with only feelings of hopelessness. This week, we discuss our experiences with mental health and how we dealt with life after our diagnoses. The most important thing to remember is that you are not alone, you are strong, and you will get through this. #11 - Emotionally Exhausted: Am I Weak? Emotions, we all have them but society makes us believe that it's a sign of weakness to show them. At work you're expected to never get angry, in a relationship you're expected to act coy, and with friends you're expected to always be happy. This game becomes exhausting and by the end of it you don't even remember what you actually felt in the first place. It takes a great deal of maturity and strength to understand your emotions and fully utilize them to live your truth freely and openly. We talk about how we've learned to embrace our emotions and open up about how we feel when we feel it. And in the process, how you can find your passion and life's purpose! Having a BFFL is one of the strongest bonds we can have! Someone who you can, without a doubt, count on and vice versa. As we grow through the different stages of our lives, we outgrow many things… can friendships be one of them? What happens when we start to grow apart from our friends? What if you realize your relationship isn't the same as before? When do you know when to fight for a friendship and when it's time to say goodbye? How do you deal with losing or letting go of a bestie? When it comes to family, it often feels like you're living amongst strangers rather than you are your own blood. Why don't they understand you and what makes you happy? Why does everything always end up in a fight or huge disappointments? How can we learn to express ourselves honestly without the weight of resentment, bitterness, and anger of past memories getting in the way? We all want to reach that point where we can have that kind of understanding with our parents and genuinely love each other for who we really are, flaws and all. Truth is, they feel the same way. Listen as we share our own personal journeys with our parents, current struggles, and how we've learned to balance doing what we're passionate about while breaking down the barriers with our family. Welcome to your 20's! You have now entered the wonderful world of ADULTING! But things aren't what you expected them to be. You're not alone. We all had grand dreams of what would happen and how it would feel like when it did (love, relationships, friendships, career). But what happens when "it" doesn't transpire at all or you didn't end up feeling the way you thought you would when "it" did? Is adulting disappointing after all? Was it all better in our heads and in our fantasies? On one hand, reality can be very sobering. On the other, it can also unlock life's abundant possibilities which are even better than your fantasies... because it's real! It just won't happen the way you pictured it. But as soon as you let go of that, life truly becomes limitless. Congrats, you've graduated! Now what? You're lost, confused, and the harder you try the more it feels like you're going absolutely nowhere. It's the pre-quarter life crisis and whether you're either unemployed or trying to figure out if you enjoy the path you've chosen, let's be real, adulting is HARD. We talk about how we found our way through our own paths and all the things we wish we knew back then that would have helped us enjoy the beginning of this beautiful journey of self discovery. This week, we talk about love, relationships, and friendships and just how toxic they can be. We've had our fair share of letting bad people stay in our lives longer than we should of because of the fear of being alone, settling, convincing ourselves this is as good as it gets, or chasing a fairytale. What are the signs of a toxic relationship? What are some red flags you shouldn't ignore? And how do you break up with someone in a thoughtful and considerate way? It's never easy to let go of someone you've loved. But you have to ask yourself, are you more afraid giving up on the idea of someone or facing reality. Admitting and facing the truth is the hardest part. However, once you can be honest with yourself then you open up that space for true self love to come into your life. #5 - Selfish vs. Selfless: Where is the Balance? There comes a point in every people pleaser's life when we stop and wonder to ourselves, am I doing this for me or ... for you? We often find ourselves essentially living someone else's life to make others happy as we become more and more miserable. This week, we chat about what it means to be selfishly selfless. Where is the balance between doing what's expected of you vs. what makes YOU happy? We share how we've learned to say no and take back what's important to us so we're able to live our happiest life now! We all fantasize about landing our dream job and spend most of our lives working to define who we are, our self worth and value. People chase money, power, and success because they believe their dream jobs will give them all that. But will it actually lead to the one thing we're all ultimately chasing - happiness? This week we share our stories of landing our dream jobs and the realities behind the fantasy. We give our best tips of how to win at work on your own terms and the heads up we wished we had gotten before we had started working. Your sense of self and purpose comes from the moments you step up and stand for your truth. And when you do that, you stand with others by your side, and that is happiness. Why are we so mean to each other? From being immature kids to now petty adults, our need to gossip and tear each other down has gotten worse. We want to dig deeper into the reasons why see each other as competition instead of a potential real friend. When did we stop empowering each other and start being so catty? How do we get to a place where we can genuinely be happy for each others' success and not feel that someone else's shine takes away from your own? We take down the myth of the glory of being Queen Bee and why true female friendships are the answers to your success. #1 - Why is Everyone Else So Perfect? 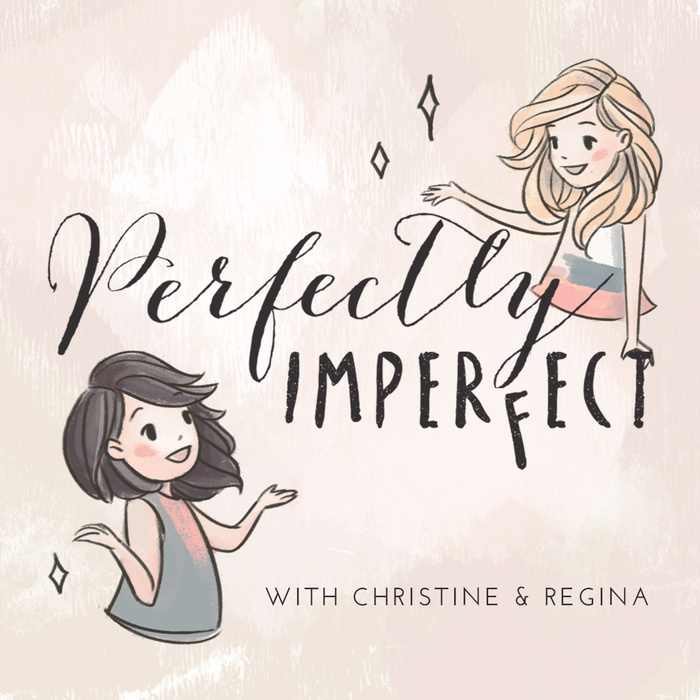 Welcome to the first episode of PERFECTLY IMPERFECT! We wanted to jump right in and talk about one of the biggest struggles we have and the inspiration behind our podcast name: how to love yourself...flaws and all! We grow up constantly being compared to others and defining our worth based on other peoples’ standards. We become unhappy and our own worst critic because we try to chase this fictitious goal of being perfect. Join in as we share how we've come to love who we are.